A small, homegrown carrot; specially bought bread fried in butter and topped with warmed pastrami; multi-colored eggplants the size of golf balls; a soup of turtle, cabbages, and scallions; even a bowl of cheap ramen or a plate of cold fried chicken: What is it about each that elicits sweet, even tearful memories of a father, a mother, a special moment of childhood? What part does food play in shaping our closest relationships, in nourishing them, and in helping us retain the best moments of them? And what happens as death approaches or as a loved one’s passing is mourned that suddenly puts food on the front burner of consciousness? 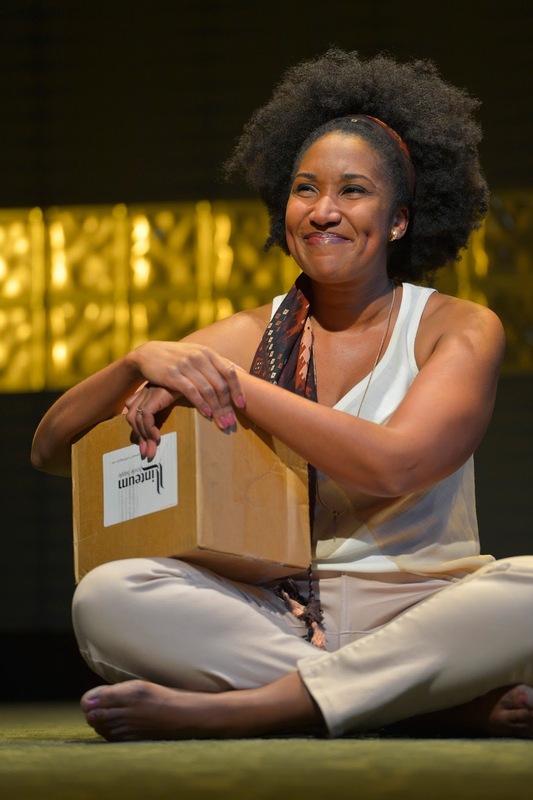 In a world premiere of Julia Cho’s Aubergine, Berkeley Repertory Theatre gently, lovingly, and powerfully poses these and other questions about how we manage the journey losing someone we love and what it sometimes takes to recapture a love we thought was no longer there. With a pace that is reverent and meditative yet never too slow to draw impatience, Tony Taccone directs an exquisite production with a cast that is to a person stellar without any one person stealing the spotlight. All feels balanced, in harmony, and even poetic as we chuckle, cry a few tears, sigh, and sit mesmerized – only to repeat the sequence of emotions several times in the two hours we are privileged to watch Aubergine unhurriedly unfold before us. The tone that works so well in Aubergine is largely embodied in Tim Kang’s portrayal of Ray, a master chef who has abandoned his profession to perform vigilance over his dying dad, now at home and in hospice care. Mr. Kang’s Ray provides few clues at first what is going on beneath his stone-set face and sad, puffy eyes. His relationship with his Korean-immigrant dad, who now lies in peaceful, comatose state in the dining room, has clearly not been the greatest since his Mom died when he was eight as she journeyed to the homeland. But Ray always approaches his ashen-faced, dead-still dad with a reverence, a respect, and an intense look that counter his cynic, snide remarks about their past conflicts, his dad’s habitual cheapness, or his resentment that he never heard praise from his Dad in what he did. Food plays into those memories of Ray as he recalls cooking a multi-course, award-winning dinner for his dad after graduation from the culinary academy – a meal that elicited course after course no more than the dismissive comment of “Interesting” and resulted in his Dad raiding the midnight cupboard for a cup of Costco Ramen. Ray may beat the kitchen counter with his fist or shake his head furiously as he remembers these moments, but he still returns to read in near tears the Bible to his non-responding dad, to fall asleep next to his bed, or just to look with a gaze that can break a heart as he clearly is searching and finding somewhere a love deeply held for this old, dying man. And he reluctantly but then meticulously with clear but unspoken love follows an uncle’s advice to make his father a turtle soup, once made by Ray’s grandmother, as his last meal, causing audience gasps as he contemplates how best to kill a cute little tortoise on stage. 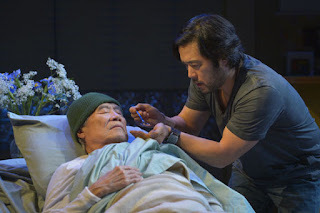 Throughout the play, Mr. Kang never rushes a movement and never overacts a moment; but he does begin to peel slowly the skins away from his rough exterior to reveal a son, a chef, and a person that is special in mundane and mystical ways. Jennifer Lim is Cornelia, Ray’s ex, who puts up a good fight but gets pulled back into Ray’s life in order to call an uncle that Ray does not know and inform him in Korean of his dying brother. Ms. Lim too is steady, under-stated, and true in her portrayal of a sophisticated, accomplished woman who looks at Ray with more than just the initial outward anger she spouts due to his inattention. Her presence becomes everyday as the bedside vigil continues, and she brings humor and heart to the scene. 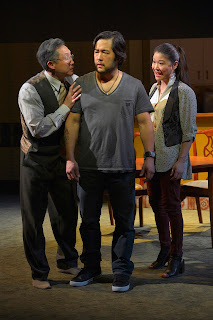 She also is the only way Ray can communicate effectively with the sudden arrival of his Uncle, the delightful, humble, but doggedly persistent Joseph Steven Yang, who converses only in his native Korean. His and Cornelia’s dialogues are translated on a screen for us as audience; but Ray misses that advantage and humorously for us and for her, Cornelia often chooses to edit the conversations between Uncle and Nephew. Uncle has ideas how to prepare his brother for the crossing over, and food plays a big part in that. While never going beyond a few broken words of English, Mr. Yang always communicates the regret of lost years with his estranged brother, the deep feelings yet he has for his sibling, and the love and caring he brings to Ray. 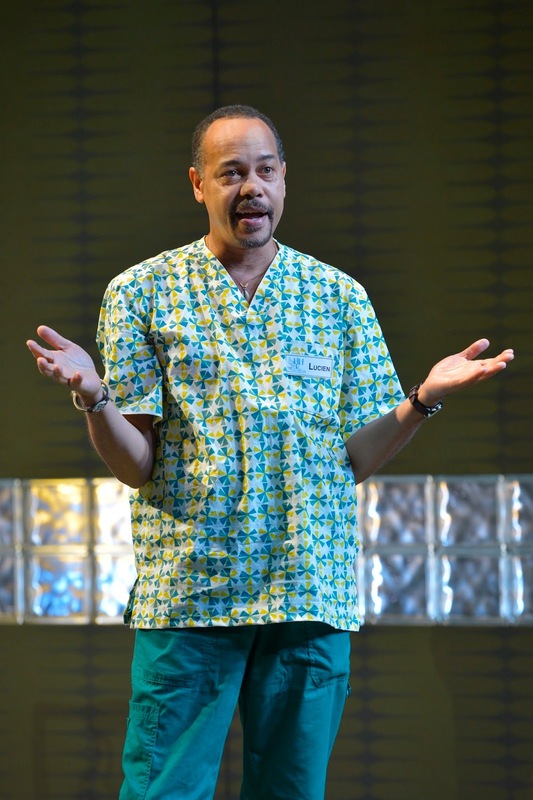 A home nurse, the tall African immigrant, Lucien, happily and lovingly attends the dying father while also increasingly teaches the son how to ready himself for the eventual death. Tyrone Mitchell Henderson flits in and out like a lovely butterfly, smiling with teeth that gleam; imparting advice in his clipped and musical voice; and revealing his own memories of food, tastes, and loved ones. The man he attends, Sab Shimono, lies most of the play still and peaceful; but appears in a number of revealing flashbacks (from jogged memories of his son) as a father that in fact was impatient, intense, and insensitive but one who also had his own moments of deep reflection and revelation. As he watches his dying dad, those memories played out in his head and on our stage propel Ray to a life-altering and affirming discovery. The play is book-ended by two compelling scenes by a young adult woman, Diane, who too has recently lost her Dad. In the opening, Safiya Fredericks slowly packs away glasses in what we assume is her father’s home while telling us a touching, tearful memory involving her favorite food and its association with a special kitchen moment between her and her dad. While we do not see her again until the closing minutes, she returns to leave a deep, final impression and helps bring a magical ending to an already fully satiating play. Wilson Chin shows off magnificently the newly renovated and newly named Peet’s Theatre and its thrust stage with a set that is simple in its modern sophistication, is flexible for quick entrances of kitchen or hospital bed, and is powerful with its stage-length thread of opaque glass that changes in hue and intensity under the artistic lighting direction of Jiyoun Chang. Linda Cho’s costumes accentuate well the personalities of each character (e.g., Lucien’s easy and open manner, Ray’s reserved and pensive soul, Uncle’s respectful and honoring presence). Rob Milburn and Michael Bodeen use background sounds to highlight without intruding and to help create the sense of remembering and coming to new realizations. As was mentioned initially, Tony Taccone orchestrates as the Director an overall masterful production that ensures that this world premiere production of Julia Cho’s Aubergine is completely appetizing to the senses and fulfilling to the soul. Aubergine continues through March 20, 2016 on the Peet’s Theatre stage of Berkeley Repertory Theatre, 2015 Addison Street, Berkeley, CA. Tickets are available at http://www.berkeleyrep.org/boxoffice/index.asp or by calling 510-647-2975 Tuesday – Sunday, noon – 7 p.m.